Though it won’t be released until November, this online-only survival game is already one of the most hyped releases of the year. 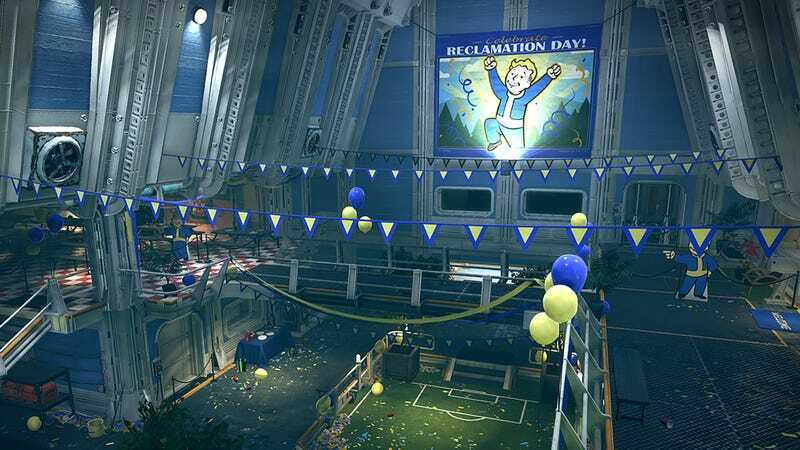 ‘Fallout 76' marks the franchise’s most expansive entry, with a world four times the size of its preceding games, and judging by fan reactions to what Bethesda teased at this year’s E3, it’s going to be the most popular ‘Fallout’ yet. Here’s everything you need to know about the game before diving into it later this year. 1. The objective of the game is to turn off the siren that’s been blaring from the White House ever since the nuclear war started. 2. Fallout 76 will feature an enormous amount of character customization, with players able to choose from any of 4,000 colors for their baseball hat, and nothing else. 3. The survival aspect of the game will require players to closely monitor their hunger, radiation levels, infatuation with Paul Giamatti, and sleep at all times. 4. Set during America’s bicentennial, the game makes several references to President Jimmy Carter’s real-life campaign to join the cast of Welcome Back, Kotter. 5. The game’s designers have decided to ditch the retro-futurism of past titles in favor of a Lisa Frank aesthetic. 6. Players can only increase their avatar’s health by eating an entire Goodyear tire in real time. 7. The “76” in the game’s title is an homage to the sexual position. 8. Though the game takes place 20 years after a nuclear war that ended civilization, Wendy’s was somehow not affected by society’s collapse at all and continued functioning like normal, giving players the option to choose the relative stability of working a Wendy’s drive-thru instead of surviving in an apocalyptic wasteland. 9. Fallout 76 is exactly like Q*bert in every way.